Blue Beetle Live Action Show in Development? Geoff Johns, DC Entertainment’s recently appointed Chief Creative Officer, seems to be very excited on his Twitter Account this morning about some developments for the DC Comics character the Blue Beetle, specifically the newest incarnation of the long-running character who first appeared way back in 1939 in "Mystery Men Comics" #1. 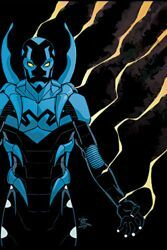 In recent years, the scarab suit has been worn by teenager Jaime Reyes after Ted Kord, the Silver Age Blue Beetle, was murdered by Maxwell Lord. According to Johns, it is the Reyes character that would be featured in a live action show, having been introduced on the animated "Batman: The Brave and the Bold" last year with plans to play a larger part on the show. The first stage of development in a live action show are recent tests to replicate how Reyes might activate his suit from the magical scarab that attached itself to his spine after Kord’s death. "BLUE BEETLE NEWS from DCE!! We have a live-action test of Jaime Reyes’ scarab activating his suit. It. Is. Awesome." "Blue Beetle’s going to appear in most of the Brave and the Bold’s this year and we’re hoping to develop a live-action show. Fingers crossed!" "If I can break it out of the vault, I’ll bring it to SDCC. LIVE ACTION BLUE BEETLE!!" Fans of one of the newest and youngest DC Comics characters certainly should be interested in the company’s latest possible foray into live action television, following the success and popularity of "Smallville" and lesser success of "Birds of Prey." Who knows whether Johns will indeed be able to show those suit tests at Comic-Con this year and where that footage might show up if he does, but let us know what you think of a possible live action television show featuring Reyes as the Blue Beetle.